New Audi flagship SUV to take on the Range Rover and inject coupe style at the top end of the firm's line-up. 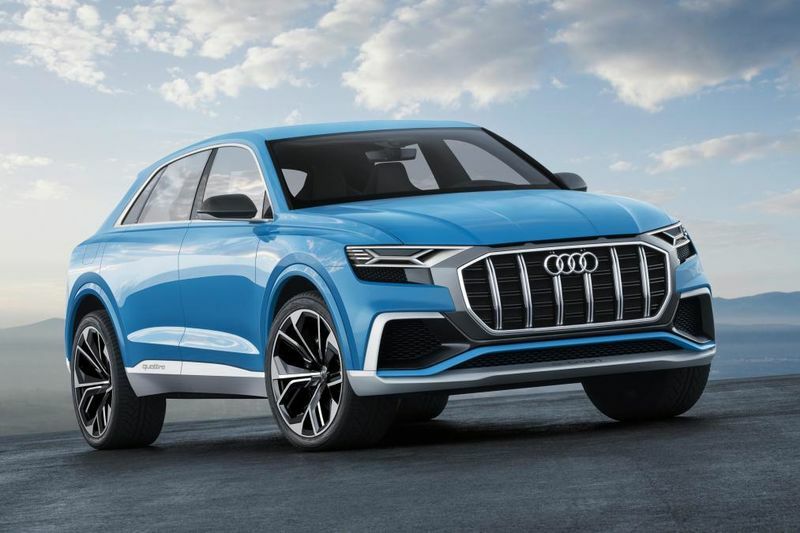 The official reveal of the Audi Q8 is just one week away – and the new flagship SUV has been teased again before we see it in the metal for the first time at the Audi Brand Summit in Shenzhen, China. The new images come in the form of both official design sketches and a teaser of the car’s details in a Q8-themed mini-series. It’s clear from the renderings that the new model will have a much more aggressive look to the Q7 on which it’s based. The front grille, though familiar in shape, is shallower but wider than the Q7’s, and the headlamp units are slimmer and sharper for a more aggressive look. The LED lighting startup animation, similar in style to the A8 saloon’s, can be seen in the teaser video. The Q8 sacrifices some practicality for a more rakish roofline. While this means that, unlike the Q7, it won’t offer seating for seven, the cabin should remain spacious as the overall silhouette isn’t radically different to that of its Bentley cousin, the Bentayga. Around the back, the Q8 features a full-width LED light bar and a pronounced rear spoiler. The new teasers follow on from a short clip that revealed the coupe-inspired look to the Range Rover rival. Brightening the teaser shots serves up a grainy look at the all-new model, though spy shots are more revealing still – spy photographers caught the car virtually undisguised in Spain at the start of the year. Unsurprisingly, the finished product strikes an admirable resemblance to the Q8 Concept revealed at the Detroit Motor Show this time last year. The front end is straight from Audi's latest catalogue, with a lower, wider grille and thinner headlights compared to the older design on the Q7. The strong shoulder line at the rear is similar to that of the Bentley Bentayga, while the shape of the sporty, pinched rear end isn't too far away from the Lamborghini Urus. It will be built alongside the Q7 at Audi's Bratislava plant in Slovakia. It will also have roughly the same footprint as its stablemate – giving it a wheelbase of three metres and a total length of over five, however, it is expected to be 40mm closer to the ground. To handle the luggage of its occupants, the Q8 has a 630-litre boot which, if benchmarked against the Range Rover’s, may appear a little small as it is 279-litres short. The tapered rear end and sloping roofline on the concept resulted in a four-seat layout, but an extra seat will join the rear of the production version before first deliveries are taken in 2018. Also included on the concept was an e-tron plug-in hybrid powertrain, which uses a 3.0-litre TFSI engine teamed with an electric motor and 17.9kWh lithium-ion battery pack. All this results in an claimed output of 438bhp and 700Nm of torque. Audi states a 0-100kp/h time of 5.4 seconds and the car has a top speed of 250km/h, while it emits 53g/km of CO2. Power is delivered via an eight-speed automatic gearbox and Quattro four-wheel drive. There’s a good chance the petrol-electric powertrain will be made available in the production model because Audi says: “Their use in the study demonstrates their importance once again.” On electric power alone, the Q8 concept can travel up to 37 miles, and the lithium-ion battery takes two and a half hours to fully recharge. The concept adopts a wider version of Audi’s single-frame octagonal grille, which is flanked by new matrix LED headlamps. The Q8 concept rides on 23-inch alloy wheels and has carbon-ceramic brakes. At the back, the LED lights stretch across the width of the concept; Audi says this will be a signature on future e-tron models. Inside, the brand has kitted out the Q8 concept with a new wraparound dash and a raft of new tech. According to official details, Audi’s 12.3-inch Virtual Cockpit display offers more functionality and a higher resolution. A new ‘control and display concept’ replaces a host of buttons with digital touchscreens on the dashboard and centre console.